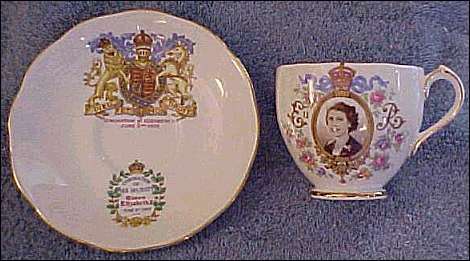 Queen Elizabeth II coronation cup and saucer by Roslyn Fine Bone China. 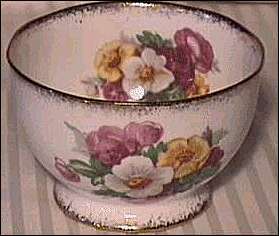 The cup is 2 7/8 inches tall and measures 3 inches across, saucer measures 5 3/4 inches across. 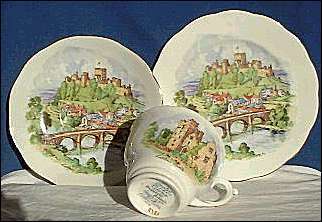 Cup, saucer & and plate trio from Roslyn china marked fine bone china, made in England, Beautiful Britain series of 6, with this being Number 6 "Ludlow Castle" , there is also a painters number R383. Handless Cup or Sugar Cube Container Decorated with Gold Enameling and Flowers. 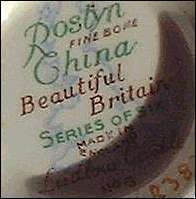 Marked Roslyn Fine Bone China...piece measures 2 1/4" High and 3 1/2" Wide. This cake plate is made of a brilliant white china, hand decorated with a beautiful cascade of flowers in shades of yellow with green entwined, and brushed gold on the rim. 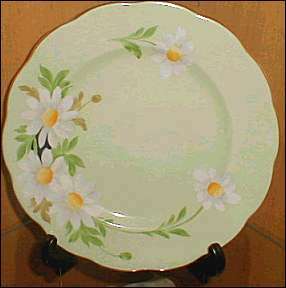 Plate by Roslyn Fine Bone China of England, - features a pattern of fresh-looking daisies on a mint green background. 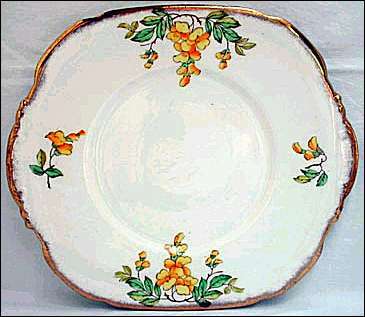 The plate measures 8" in diameter, and has a scalloped edge trimmed in gold.